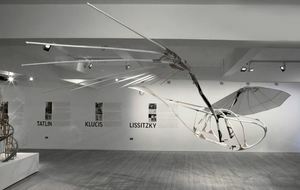 An amazing and highly probable flying machine hangs from the ceiling in a gallery space near Oxford Circus. It resembles the hybrid offspring of a seagull and a bicycle, with wooden struts, a keeled frame and cloth-webbed wings. Its design is a seamless fusion of form and function, man and machine. 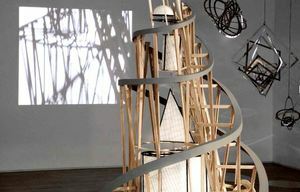 It has has been skillfully recreated by artist Henry Milner, working from designs by Vladimir Tatlin, one of the founders of the Constructivist movement. GRAD Gallery's current exhibition features the precise geometrical forms and flights of imaginative architecture conveying the utopian ideals of the Constructivists. Although originally intended to further the political message of Communism through creating visions of a Communist Utopia, the Constructivist movement in Russia also revolutionised art and design, ushering in modernism and abstract expressionism. Russian Constructivist art and architecture sought to re-envision art as a collaborative venture and had, as another of its chief aims, the engagement with material and form. In this exhibition, the works of key members of the Constructivist movement are reconstructed by Milner, who works directly from original sketches and blueprints and also curates film and other documents to produce an archive of the Constructivist movement. The exhibition is spare, but the structures and documents on display are inspiring feats of imagination, even within their politicised context. On display are the recursive geometric experiments of Rodchenko and Lissitzky and the pioneering designs of Klucis. Most impressive is Milner's reconstruction of Vladimir Tatlin's "Monument to the Third International" a spiralling and dynamic architectural form that embodied the Constructivists' utopian ideals. The tower was originally intended to house the Communist World Government, but was never built. Milner's research has recreated a model of this tower in careful detail. The forms and ideals behind these works clearly convey a utopia of design and craftsmanship. GRAD Gallery's Utopia Ltd runs until 20 December, 3-4a Little Portland Street, W1W 7JB. Opening hours: Tues-Fri 11am-7pm, Sat 11am-5pm. Admission Free.